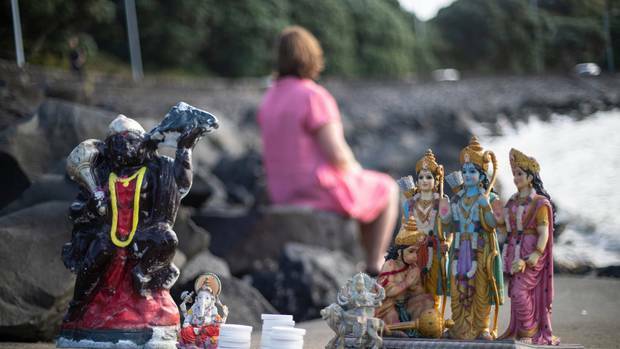 NEW ZEALAND, March 11, 2019 (NZ Herald): Statues of Hindu Gods, Goddesses and Deities are being discarded at Auckland beaches as part of a religious practice - but concerns are being raised about it posing a risk to beachgoers and wildlife. An Auckland mother who has been cleaning beaches from Okahu Bay to Glendowie says she has been picking up statues and shards of broken pieces - mostly at Biddicks Bay and Mission Bay. Auckland beaches are already facing a dangerous litter problem with broken glass, syringes and dumped asbestos among the rubbish picked up. AUT University Professor of Diversity Edwina Pio said usually after a religious festival or celebration, such as Vinayaka Chaturthi which celebrates the birth of Hindu Deity Ganesha, statues were "released" into the sea or lakes. Pio said the practice among Hindus originated with clay statues painted with vegetable dyes, but many statue makers now used non-biodegradable material like plaster of paris, paints and dyes which are not soluble and can cause harm to the environment. "Casting away statues is also a stark call for religious leaders, communities, local and government bodies to quicken the pace of framing appropriate guidelines," Pio added. An Auckland Council spokeswoman said it was working with the Hindu Council to develop recommendations on how statues and cultural offerings could be immersed in an eco-friendly manner. Hinduism is the second largest and the fastest growing religion in New Zealand, with more than 90,000 followers according to the 2013 Census.